NAMM 2019: Rob Chapman's gear empire continues to expand apace with the introduction of a new pedal brand, dubbed Snake Oil Fine Instruments. The brand makes its debut with a boost and distortion, named The Very Thing and Marvellous Engine. Channeling Victorian-era marketing imagery, the pedals are made in the UK and feature high quality components and embossed decals. 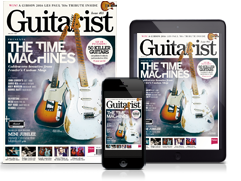 Promising on its case, no less, to "restore activity and vigor to the guitarist", The Very Thing is a boost with a built-in 4558 dual op-amp, which offers smooth drives and plenty of headroom. The firm's first distortion pedal channels classic high-gain Marshall-style tones, offering gain, distortion, tone and level controls, plus a voice switch under the casing, which engages another clipping stage. Both pedals will retail for £149.